This image floated on Facebook a while ago, eliciting a mixture of sympathy, and stories of good upbringing and boot straps. 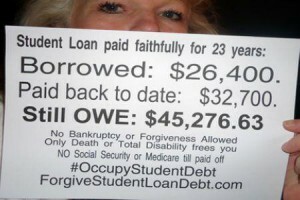 Let’s discuss the student loan situation. Let’s say you got into NYU, and you’re not getting anything from your family and won’t earn a significant amount of money while going to school. Enough for some burgers and movies. According to http://www.nyu.edu/global/international-immigration-services/students/inbound-to-nyc/pre-arrival/estimatedexpenses.html yearly tuition, housing and expenses will be about $74k. That’s not that ludicrous an amount. You might get down to $50k somewhere else, but still expensive. You could go to a public university and live with your parents, maybe even go part time while you work. Or get a scholarship. Those would probably be decisions to make, but if you get into a great program at a big name university and you really feel the program they have is critical to your future, those might not seem like options. Or perhaps you just don’t understand money and compound interest. So back to NYU. 4 years comes to about $300k. Don’t imagine this is astronomical and unique. You could find lots of universities that end up being similarly expensive. Here’s a fun article on average costs for different types of US colleges & universities. According to The National Center for Educational Statistics, only 73% of 25-34 year olds with bachelors degrees were full time employed. Of those, the average salary was about $47k. Let’s assume our student jumps from graduation to a full time job with that same salary that people who have been out of college for 10+ years are getting. Amazingly unrealistic, but we want to imagine the best case scenario for our graduate. Stafford loan starting rates for undergrads are going up to 4.66%. Let’s say our student got the best rate possible for all loans. After all, he’s a super dude. Even staying single and living a spartan life in NYC, where he graduated and made his connections and landed his good paying job, life is not cheap for our graduate. According to this fun little analysis you need $40k a year to live in NYC. That leaves $7k a year for your loans. Without interest, paying off your $300k loan would take more than 40 years. Unfortunately there is interest. And it compounds. And you can’t just pay whatever you feel like. I put the numbers into the Loan Calculator at http://www.finaid.org/calculators/scripts/loanpayments.cgi, and specified an extended repayment. Here are the results. 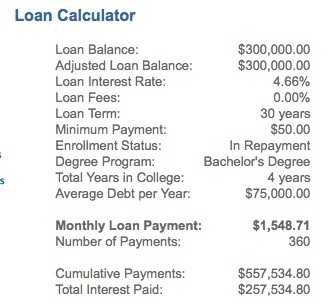 $1,548.71 per month comes to $18,584.52 per year, over 2.5 times what our graduate had ready for loan repayment. And remember, this is assuming good loan rates, graduating in 4 years, and getting a good job right out of the gate. You might need to get an income based repayment plan, deferment, forbearance, or something. But that loan isn’t going away, and interest will grow in most situations. The cost of college and the student loan system burden people with a life sentence of debt they will have a hard time paying off. It’s certainly a cautionary tale, and hopefully people are looking into low cost schools (public, foreign, etc.) and ways to subsidize the expense (scholarships, work, military service, etc. ), but for many people they are stuck with loans that don’t go away, even through bankruptcy, and will damage their credit, cause collection efforts, or at the very least cause a serious financial burden. What are the options for preventing people from getting massive student loans and for helping those already carrying student loan debt? I don’t disagree with the problem at all, I’ve lived with/through it. But this story might be a little on the expensive side. It’s plausible, but probably not the standard. Student-loan interest is un-taxed expense and is worth a pretty hefty deduction. Especially at first when you’re paying substantial amounts of interest rather than loan balance you may pay very little in taxes. I realize that you intentionally excluded some of these possibilities from your scenario to point out the possible cost. But the cost can be very different. I was actually trying to stack things on the side of the graduate, though. Graduate in 4 years, get a good job right from graduation. The amount of loans or the cost of living in NYC might seem high, but depending on what you want to do for work, you may need to be in NYC or SF or some other very expensive city. 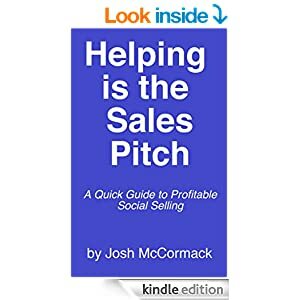 Even if you factor in a lot of the points you raised, unless you have a lot of good fortune and wisdom, you’ll likely be saddled with a huge burden.